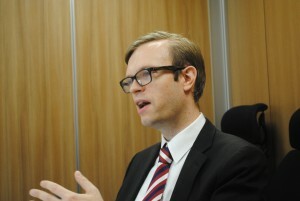 Mr. Robin Harding, the Financial Times’ Tokyo Bureau Chief, used to work in the financial sector. He spoke with us about his career change from banker to journalist, his experiences studying for an MBA in Japan and how he sees Japan through his reporting activities. 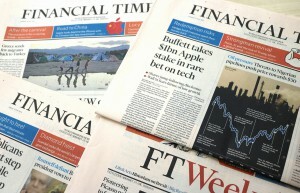 Before joining the Financial Times, I worked in various financial jobs in the UK. I was not a very good banker. I didn’t suit corporate culture, and at that time in the early 2000s, the financial sector was selling some very bad products to its customers. But I’m fascinated by economics and finance and I wanted to write about them. Before taking those jobs, I had come to Japan to study as a graduate student. Why Japan? Looking back, I believe my mother was a significant influence. She was a librarian at Oxford University in charge of foreign books, including those from Japan and the rest of Asia, so I was always interested in Japan. I was also lucky enough to receive a scholarship from the Japanese government. I’d never been to Japan before I arrived as a student, but I loved Japanese literature, so everything I knew came from books. In particular, I remember reading Snow Country, by Yasunari Kawabata and The Wind-Up Bird Chronicle by Haruki Murakami. When I first came to Japan in 2001, the economy was at an interesting moment. It was a decade since the bubble, but people still thought of Japan as a sleeping giant; it was around that time the Bank of Japan started experimenting with zero interest rates, so Japan was a subject that everyone who followed economics was interested in. What I enjoy most is studying economic arguments like this, participating in them, and trying to explain them in words – that is what led me to journalism. When you think of UK news media covering economics, you think of the Financial Times. I had been reading it since I was in university and admired its values: liberal, international and driven by facts and evidence rather than any particular ideology. The FT takes subjects like economics seriously, rather than just reporting on the surface of things. After a three-month paid internship, I became a leader writer, which is a job many journalists do at the end of their career. One day I’d be writing about the US economy, the next day about Swedish politics, and then maybe corporate governance. It was an amazing education. Two years later, the job of Tokyo correspondent was advertised inside the company, and I applied. It was my big chance to return to Japan. The Japan story that has made the biggest impression on me so far is the Great East Japan Earthquake. I was working at the Washington Bureau at the time, but I came back to Japan to help the Tokyo Bureau cover the story. There was a tension in the air in Tokyo because of the situation at Fukushima Daiichi – it made a familiar city feel eerily different. I covered the business and economic news in Tokyo, freeing my colleagues to go to the disaster-affected areas. People in the UK aren’t always interested in Japanese politics or society, which isn’t a surprise – how many Japanese readers are interested in the details of UK politics? But our job as correspondents is to find ways to make our readers care. Some stories are easy, like an economic or business story that will affect world markets. Our readers are also interested in Asian geopolitics, or stories about Japan that relate to their own concerns, such as the effects of an aging society. We also work hard to find hooks that will make these subjects interesting to our readers. So, for example, instead of just writing about Chinese tourists we wrote about how they buy high-quality Japanese condoms to take home and the article earned ten times our usual number of page views (“Okamoto condoms: objects of desire for Chinese tourists in Japan”). Or an article about Shimano, framed as being about professional bicycle racing, got five times the average number of views (“Pro cycling rule change to propel Japan’s Shimano”). Fifteen years have passed since I first came to Japan. It’s hard to say for certain, as I myself have changed with experience, but I feel that Japan has changed significantly. On the positive side, I feel like Japan is more open to the world – it used to be treated as an exotic exception, but that happens less and less, and I think that’s good. On the other hand, society feels more elderly, and has less energy than it did before. The Japanese economy is still in an interesting place: the fight against deflation, the huge stock of public debt and the falling population will produce important stories for journalists. I am also interested in the shape of Japanese families as the low birthrate continues, and would like to visit areas outside of Tokyo more often. Tokyo Bureau Chief for the Financial Times, one of the UK’s leading economic newspapers. Received a degree in economics from Clare College at the University of Cambridge. From 2001 to 2004, studied at Hitotsubashi University on a Monbukagakusho Scholarship, where he received a master’s degree in economics. Joined the Financial Times in 2006, and worked as a Tokyo correspondent from 2008 to 2010. Worked at the Washington Bureau before starting at current role in 2014. His reporting focuses on Japan’s economy, politics and international relations. Established in 1988, the FT is one of the most famous economic and business newspapers in England. Well-known for being printed on salmon pink paper, it has a circulation of about 730,000 (online and print). Of this total, 500,000 are online, which has drastically increased over the last five years.